good job, now here is this weeks photo. I hope to see more posts during the week. What?? The Viking Hippie’s pregnant?! 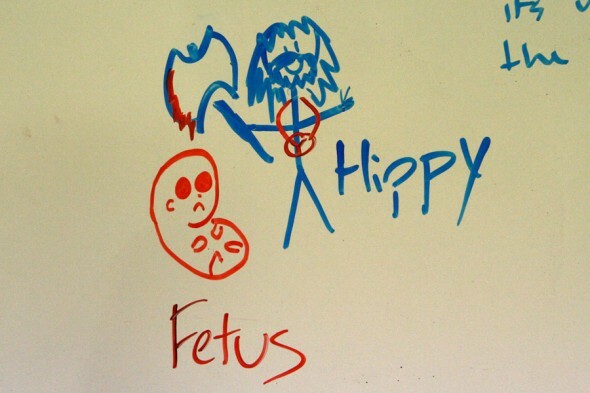 Image of an un-American freedom-hating God-hating communist murdering an unborn child! Filthy fag baby-killers like this one will feel God’s wrath and burn in Hell for eternity! Who’s ready for more fresh stem cells?! Day 67: My cover is still solid here in the commune, none of these stinking, drug addled hippies have noticed that my medallion is really a mercedes-benz symbol, just upside down. once i sacrifice the commie fetus to the God of Capitalism, this commune will be rent asunder and all who live here will beome stockbrokers!